Grown Folks is an American 30 minute scripted comedy television series, which kicked off on October 3, 2017, on BOUNCE TV and is broadcast every Monday at 21:30. The show is currently in its 1st season. 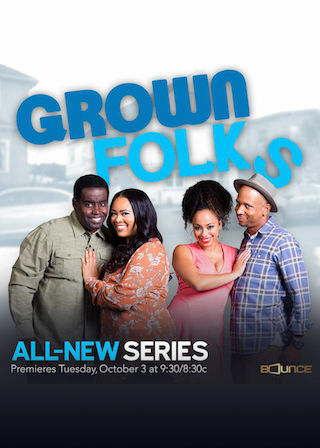 BOUNCE TV is yet to announce the renewal of Grown Folks for Season 2 as well as its cancelation. Sign up to track down the show's status and its release date. From the creator of In The Cut and Family Time, Bentley Kyle Evans, comes Grown Folks, a half-hour situation comedy about two blue-collar couples who share a duplex while navigating life, marriage and friendship.